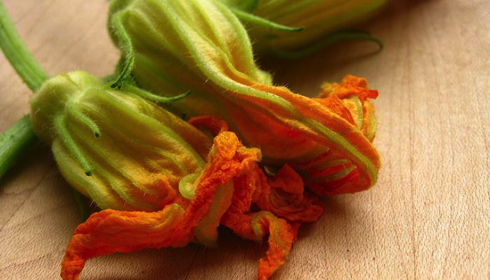 My favorite way of enjoying zucchini blossoms is dipped in batter and fried, because the crunchy saltiness of the crisp golden batter beautifully complements the sweetness of the flower itself, without overshadowing the flower's delicate flavor. Here's a simple recipe that supposedly will serve about 6, though in my experience it's being optimistic You might eat these like candy; they are that good. Fry up a batch, enjoy them fresh, then do more. You want male flowers which have stems. Females are attached to the squash. Harvest flowers once they have just opened and use them as soon as possible. If you wash the flowers, do it very gently and dry them suspended upside down. Both the coatings below are excellent. The first is fly-away crisp and a more batter-like finish. The second is the author’s grandmother's and is barely noticed on the flowers. Use a cold-pressed vegetable oil (peanut or grape seed oil are best), if possible. Gently remove the pistel from each flower. Cut stems to about 1 inch. Make sure blossoms are dry. Heat 1 inch of oil in a 12-inch saute pan over medium high until oil is hot but not smoking. It should be about 365 degrees on a candy thermometer. Have eggs and flour in 2 shallow soup dishes. Dip several blossoms in the egg, let most of it drain away, then roll in flour, shaking off excess. Fry a few minutes until crisp and golden brown on both sides. Drain on paper towels, season with salt and serve hot. Variation: My grandmother also often made a light flour and water batter, blending it to the consistency of heavy cream. After dipping the blossoms, most of the batter was allowed to drain away.